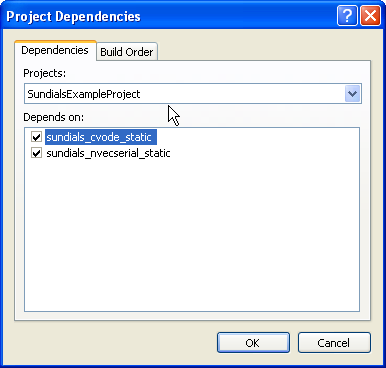 NOTE: For a tutorial on using CMake and Visual Studio for building and installing Sundials v 2.4.0 (which now includes the required CMake configuration files with the source distribution), see this page. Using CMake as a build system for the SUNDIALS library has the advantage that GUI based build configuration is possible. 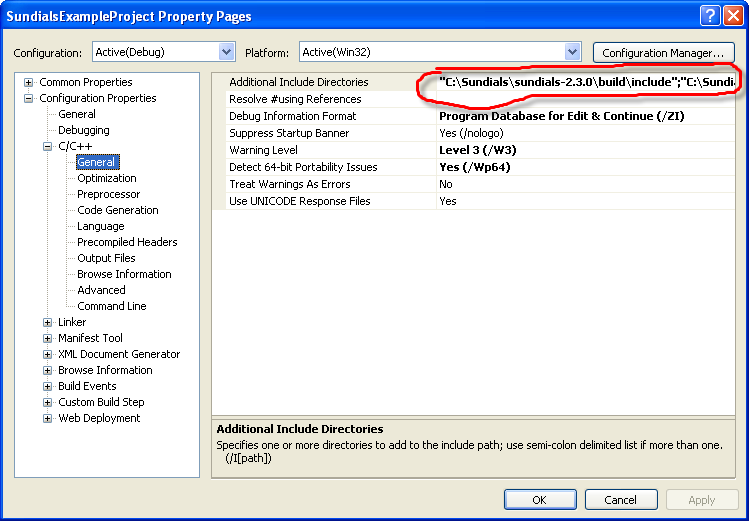 Also build files for Windows development environments can be easily generated. On the Windows platform compilers such as the Borland C++ compiler or Visual C++ compiler are natively supported. 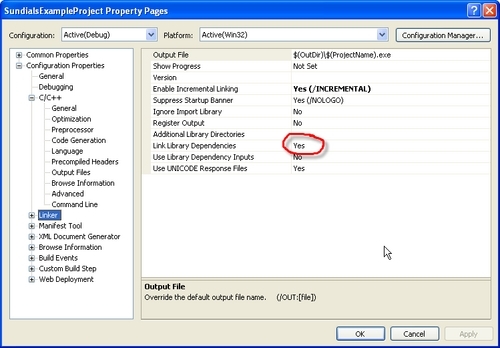 The installation options are very similar to the options mentioned above. Note, however, that CMake may not support all features and plattforms that are supported by the autotools build system. You may need to get CMake if it isn't available on your system already. And you will definitely need to download the cmake build files from this page. In order to use the CMake build system, you need a fairly recent CMake version. You can download it from www.cmake.org. If you are building cmake from sources on Linux/Unix, make sure to have curses (including development libraries) installed, so that ccmake gets compiled as well. Build instructions for cmake (only necessary for *nix and linux systems) can be found on the CMake page. 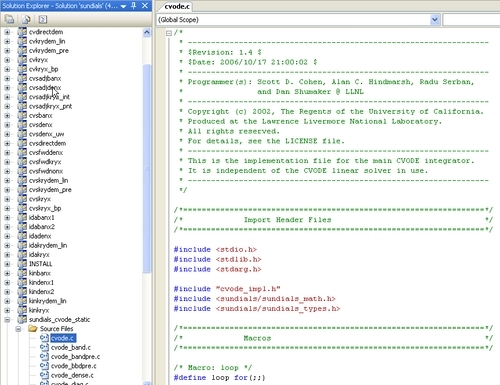 Once you have CMake installed, you should be able to use CMakeSetup.exe on Windows and ccmake on Linux/Unix. Now create a subdirectory 'build' inside the sundials directory (you can also create the build directory anywhere else, simply substitute the .. in the next command with the sundials source directory). Next change into that directory and run ccmake. 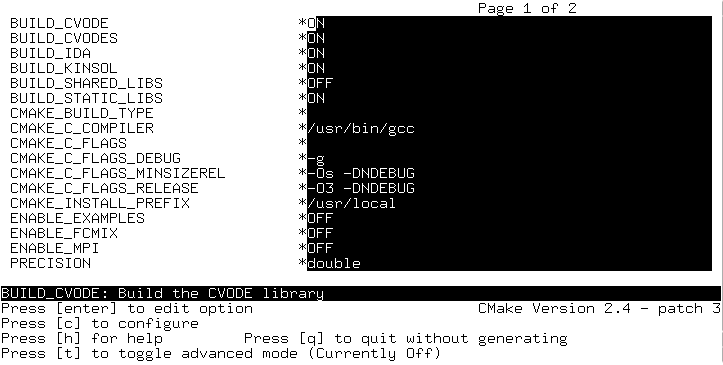 You should now see the ccmake curses interface. Press 'c' to configure your build with the default options. You should see an option listing like in the following screenshot. In the dialog you can adjust the build options. For details see the options above in the autotools section. To adjust advanced options press 't' to show all the options and settings CMake offers. After adjusting some options, for instance enabling the examples by turning ENABLE_EXAMPLES ON, you need to press 'c' again. Depending on the options, you will see new options at the top of the list, marked with a star. After adjusting the new options, press 'c' again. Once all options have been set, you can press 'g' to generate the make files. The first part in this section is a step-by-step compilation and usage guide for Visual Studio users (namely Visual Studio 2005 aka VC8). 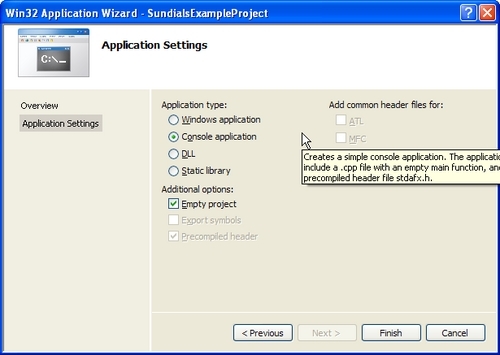 In the second part we have a guide on how to build Sundials using Mingw32 GCC or other compilers, which is very similar to the method used on Linux/Unix system. The first common part is the extraction of the archives, which is due to a lack of native support of tag.gz files not quite as trivial as on Linux. Use the "Extract here" option again on the sundials-2.x.x.tar file and all the files will be extracted into a new sundials-2.x.x subdirectory. Now the sun_cmake.tar needs to be extracted into the new sundials-2.x.x directory. 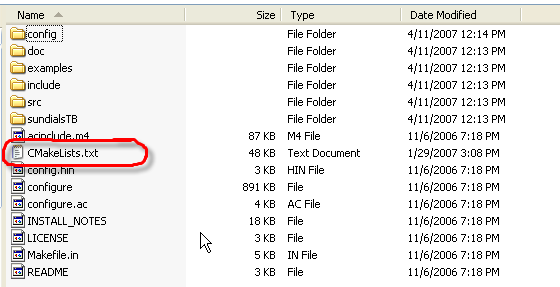 So use the "Extract files…" option from the 7-zip context menu and select the sundials-2.x.x directory (in my case C:\sundials\sundials-2.3.0) as target directory. After the files were extracted you should see a CMakeLists.txt file in the directory listing of the sundials-2.x.x directory. Now you need to open a console window. In the case that CMakeSetup.exe doesn't start the CMake configuration utility, check that the CMake bin directory is in your path environment variable. Now you should see the CMake configuration dialog. 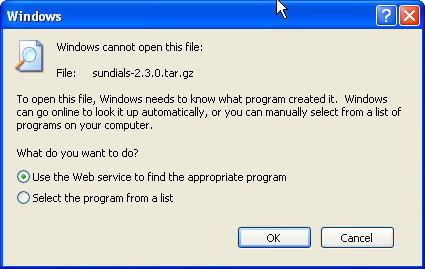 First select the sundials-2.x.x as the source directory. 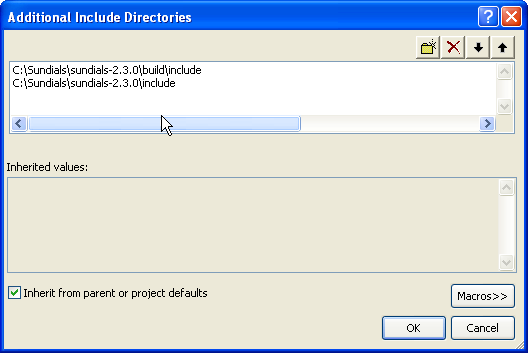 Then copy this directory over in the "build" directory and append the directory name 'build'. 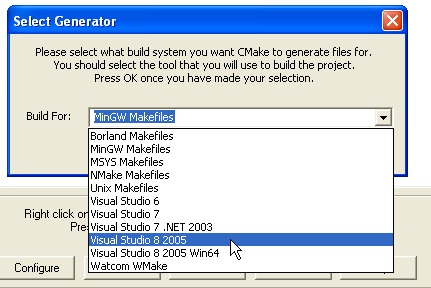 Select 'Visual Studio 8 2005" (or select a different make file generator, if you work with a different version). 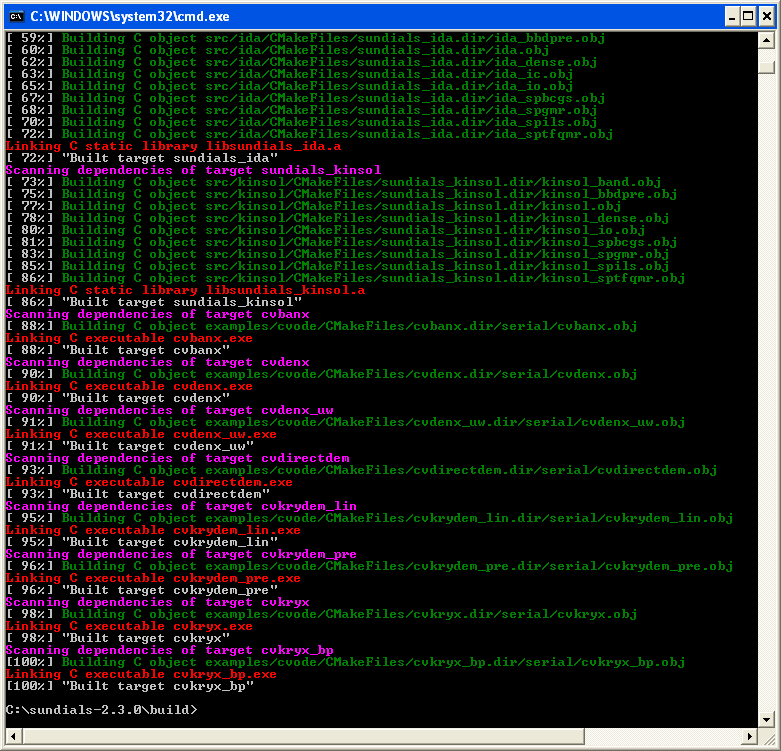 The CMakeSetup.exe tool will now verify the build tool chain and determine the compilation options. Once completed, you will see a list of build options to select. (If the build chain detection fails, there is probably some problem with the VC8 installation or some missing/wrong environmental variables). You can now adjust the listed options to your needs. Once you are finished, simply click 'configure' again. All options, that are fully configured will turn grey, indicating that you are ready to generate the makefiles. For instance, you can turn compilation of the examples on. Now simply double click on the ALL_BUILD.vcproj project file and Visual Studio will open with a (long) list of generated projects. Having the libs compiled, now it is fairly easy to use them in your own projects. First close the current solution and create a new Win32 console project. 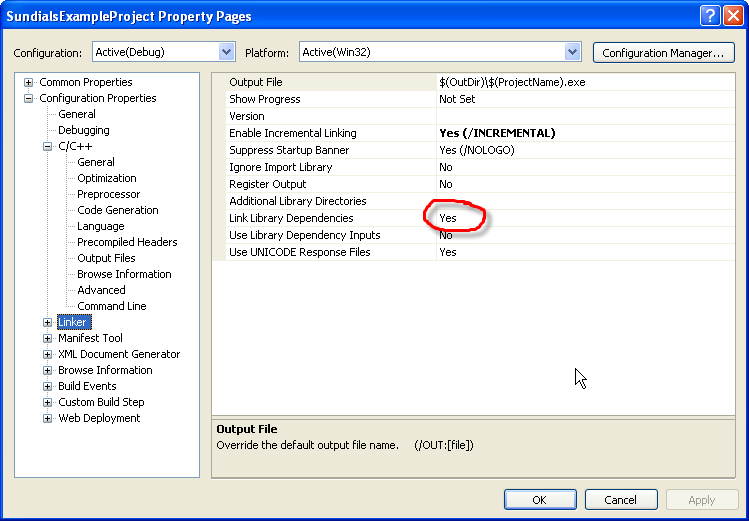 In the "New project" wizard set the following Application options to create an empty project. 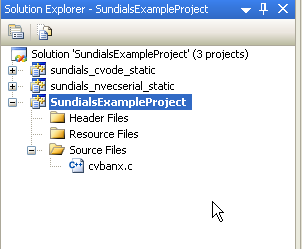 Also add the example program C:\Sundials\sundials-2.3.0\examples\cvode\serial\cvbanx.c to your empty console project. This requires a console window with a correctly set path variable for mingw. First create a subdirectory 'build' inside the sundials source directory (you can also create the build directory anywhere else). 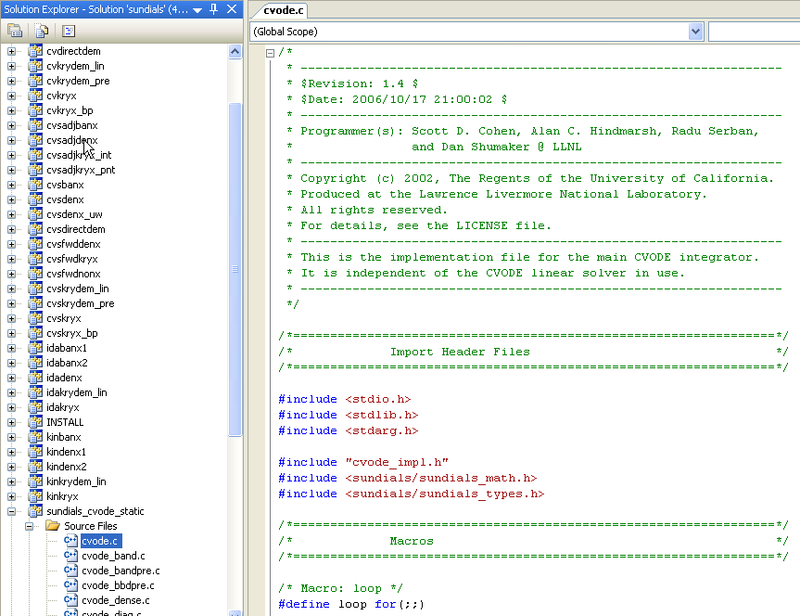 Next run CMakeSetup.exe with the sundials source directory as command line argument. Or simply run CMakeSetup.exe and select the source and build directory from the directory combo boxes. When pressing 'configure' for the first time you will be prompted with a choice of build systems. Select the compiler/build system you want to use and press 'OK'. In the dialog you can now adjust the build options. For details see the options above in the autotools section. Check the "Show advanced values" checkbox if you want to set advanced options. After adjusting all options press configure again (all lines should become grey) and Ok to generate make files and quit the GUI. 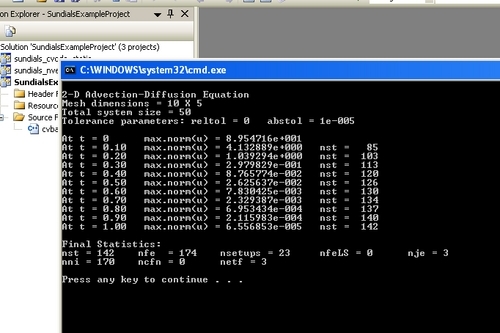 Now you can run your build systems make tool, e.g. mingw32-make for mingw, make for Borland C++. To use the Intel Compiler you need to create nmake build files and you must start the console window from the provided start menu entry. Due to a bug in cmake (which also parses the comments in Fortran source files), some of the Fortran examples in SUNDIALS will not build unless they are slightly modified: you must remove all occurrences of "use" and "module" in comments. 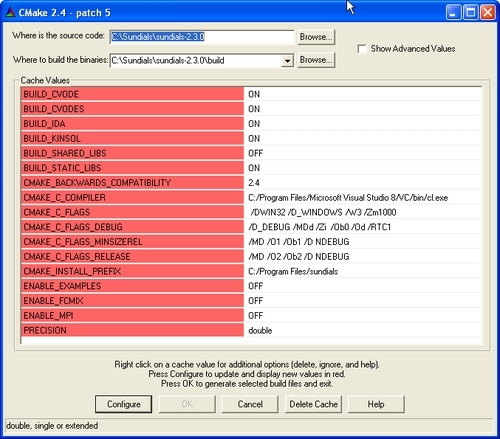 The affected files are fcvdenx.f, fcvkryx.f, fcvkryx_bp.f (in examples/cvode/fcmix_serial) and fidadenx.f (in examples/ida/fcmix_serial). 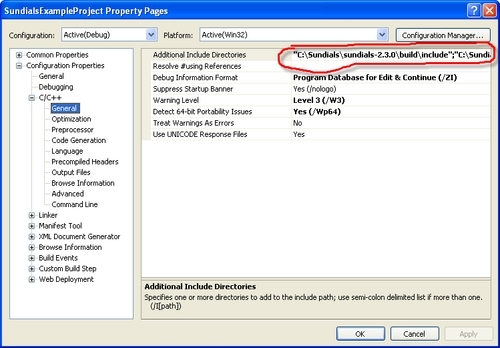 The installation of examples follows a new philosophy (which will be adopted in the next release also for the autotools-based build system): If examples are enabled by the user, "make" will build all pertinent examples together with the SUNDIALS libraries, but "make install" will export (in a subdirectory of the installation directory) the example sources and sample outputs together with automatically generated configuration files that reference the installed SUNDIALS headers and libraries (and which can therefore be used as "templates" for your own problems). The configure script will install makefiles. CMake installs CMakeLists.txt files and also (as an option available only under *NIX) makefiles. 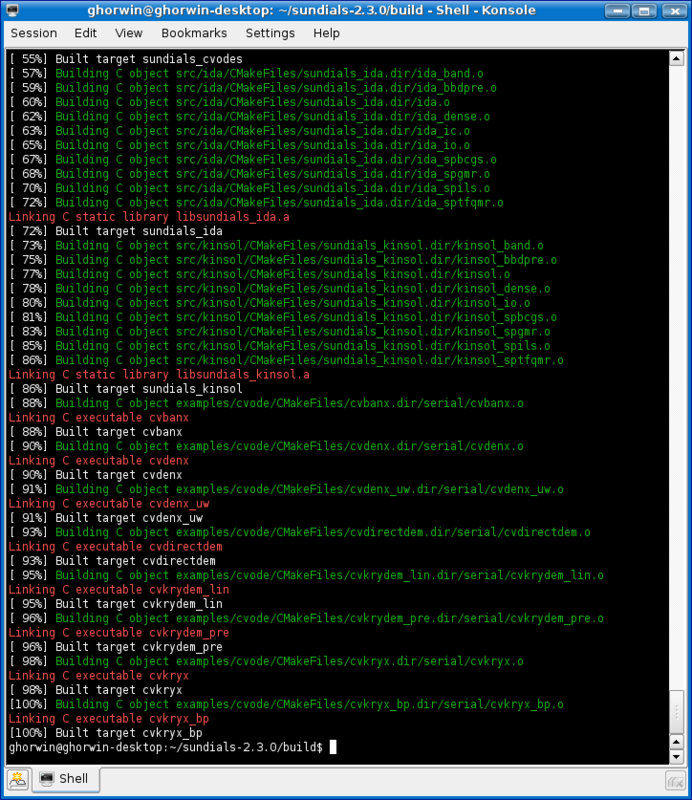 Note: the exported example makefiles are generated from templates (also included in the attached tarball). As with autotools, even if generation of shared libraries is enabled, only static libraries are created for the FCMIX modules (due to the use of fixed names for the Fortran user-provided subroutines, FCMIX shared libraries would result in "undefined symbol" errors at link time).